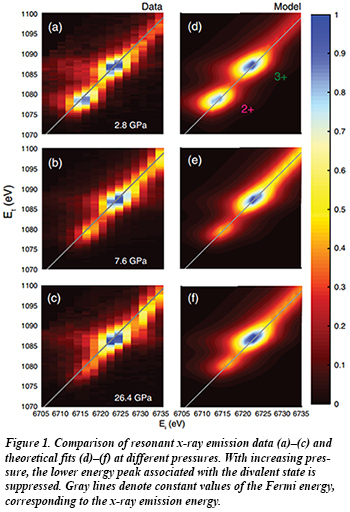 Applied pressure is a powerful tool for studying rare earth systems with intermediate valence because their electronic states are sensitive to small changes in interatomic separation. Recent experiments at HPCAT using resonant x-ray emission spectroscopy have explored the pressure dependence of the f-electron occupancy in the Kondo insulator SmB6. Results from a group of collaborators from the University of Maryland, Columbia University, Lawrence Berkeley Laboratory, Lawrence Livermore Natioanal Laboratory and HPCAT show that pressure reduces the f electron occupancy (Fig. 1), but surprisingly, the material maintains a significant divalent character up to at least 35 GPa. Thus, the closure of the resistive activation energy gap and onset of magnetic order are not driven by stabilization of a state of integral valence. Over the entire pressure range, the material maintains a remarkably stable intermediate valence that can in principle support a nontrivial band structure. Beam time for these and related experiments carried out by the Livermore group was provided by CDAC [N. P. Butch et al., Phys. Rev. Lett. 116, 156401 (2016)].